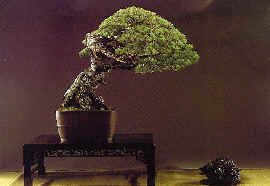 Bonsai is the traditional Japanese Art of appreciating the beauty of nature in intentially dwarfed potted trees. The wish to enjoy living plants - their growth, their beautiful flowers, fruits and leaves - as closely as possible is common to people throughout the world. The Japanese have expressed this wish in creating the art of bonsai. The literal meaning of bonsai is "potted plant". But Bonsai is more than just a potted plant: It is the attempt to represent nature itself in a small pot. A bonsai conveys the impression of an old huge tree, a forest or a landscape in nature. It is a miniaturized reproduction of anture, but at the same time a living tree. Nurturing such a small piece of nature over many years can become a source of pleasure and recreation. The art of bonsai has a long tradition and bonsai have been cultivated in Japan over many centuries. Paintings of bonsai can already be found in picture scrolls of the Kamakura period (1192 - 1333). Some of the bonsai, which were cultivated in the Edo period (1603 - 1867) about two or three centuries ago, are even still alive today. Bonsai is appreciated today not only in Japan, but also in many other countries as a "living art", which has not only form but also spirit. More and more people around the world are discovering its beauty and find pease of mind in this fascinating hobby. We hope the "spirit of bonsai" will become a symbol of peace.